Climate Council of Australia is a high-profile climate change campaign organisation, whose “Chief Councillor” is former Australian of the Year, Professor Tim Flannery. (It could be argued the Council has more than enough chiefs, with others occupying the roles of Chair and CEO.) Although he has written books on climate change, Flannery’s main areas of academic research have been zoology and palaeontology. The Climate Council was created after the former Climate Commission, an independent body created by the federal Labor government in 2011, was disbanded two years later by the newly elected conservative Liberal/National coalition government. Flannery had been Chief Commissioner. The Council has issued ninety-five reports, with an unfortunate feature of some being what they’ve omitted rather than what they’ve included. Two examples have dealt with the related issues of land clearing in Queensland and land carbon in vegetation and soils. In addition to highlighting the extent of clearing, the main points of the report were: (a) government policies affect the rate of land clearing; (b) land clearing contributes to climate change; and (c) key aims of land use policy should be to avoid clearing, allow regrowth and encourage replanting. The only risk referred to (despite the use of the plural “risks” in the title) was the supposed “risk of reversal”. The authors argued that we must not rely on land carbon to offset fossil fuel emissions, as sequestered carbon could be released back to the atmosphere by land clearing or natural disturbances, thereby reversing the initial sequestration. The only opportunities referred to were those involved in strengthening a bill currently before the Queensland parliament, which proposes amendments to Queensland’s Vegetation Management Act 1999. Despite those alarming figures, in its report dealing solely with land clearing in Queensland, the Climate Council said nothing about livestock-related clearing. Indeed, almost laughingly (if it were not so serious) the report compared “land use sector” emissions with those of the “agriculture sector”. Here we have an organisation whose reason for existence is to “provide independent, authoritative climate change information to the Australian public” willingly accepting the dangerous deception of “internationally agreed definitions and methodologies for carbon accounting”, without considering the reality that land clearing for livestock grazing is an agricultural sector activity. It is those “internationally agreed definitions and methodologies” that have assisted policy makers to effectively ignore the livestock sector’s overall contribution to the climate crisis, willingly playing into the hands of their industry supporters. The issue has been raised by this writer with Flannery and his fellow commissioners Amanda McKenzie (CEO) and Will Steffen, but they have chosen to ignore it. Its main argument was that carbon sequestration on land should not be considered a valid offset for fossil fuel emissions, as it may be seen to excuse such emissions. However, in a landmark 2008 paper, Dr James Hansen and his fellow authors argued that sequestration of carbon in land sinks was an essential component of returning atmospheric carbon concentrations to 350 parts per million (ppm). Hansen had been prompted to establish a target by climate change campaigner and author, Bill McKibben, who adopted the figure as the name of the organisation he co-founded, 350.org. Despite the differences in estimates, even the Climate Council states (with my underlines), that we must “return back to the land as much as possible of the atmospheric carbon that originated from the land”. (p. 15) Yet it effectively ignores key measures required to do so, including the critical measure of a general transition away from animal agriculture. 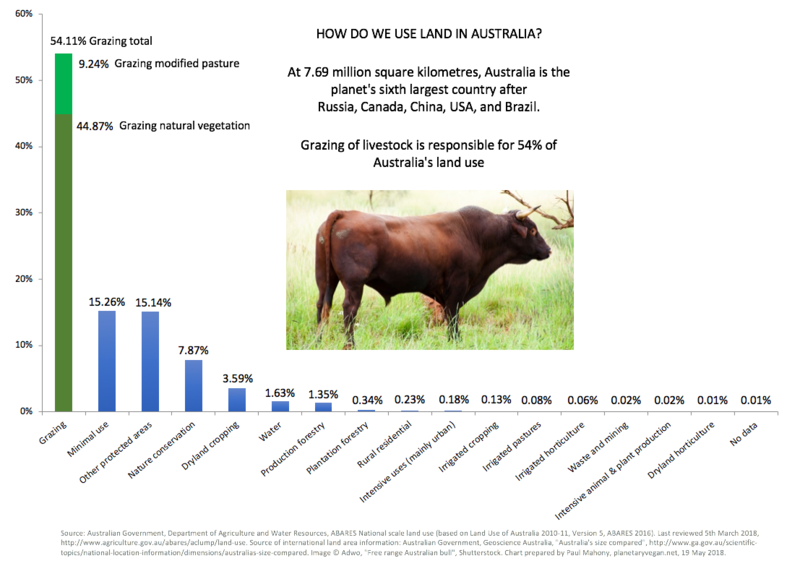 An example of the Climate Council appearing to ignore the issue is its view that cattle grazing represents an ongoing limitation to the amount of land that can be used for carbon sequestration. (pp. 29-30) That is a similar approach to that of climate change author, Philip Sutton, who referred to the need for reforestation in a September 2015 seminar, while expressing concern over perceived difficulties of such a requirement in relation to food production. Both ignore the fact that far less land would be required for food production if we were not relying on animals as a nutrient source. When mentioning agriculture in the caption to a related image, there was no reference to the animal variety. Although the Climate Council is willing to use alternatives to standard methods of reporting in relation to fossil fuels (by including exported fossil fuel emissions in Australia’s figures), it has retained conservative standard reporting methodologies in relation to land use emissions. (p. 20). Much of the land that is grazed has not been cleared, but the grazing has had other destructive impacts, including: the introduction of invasive pasture grasses; manipulation of fire regimes; degradation of land and natural water sources; and (particularly relevant to climate change) loss of soil carbon. The introduced species are destroying fragile landscapes that have not evolved to cope with them. Another issue in which the Climate Council has ignored livestock production’s impacts has been coral loss on the Great Barrier Reef. Less than two months after this author posted an online presentation highlighting links between environmental organisations and the livestock sector, the Climate Council (which had been included in the presentation) posted a short article on the impacts of animal agriculture. [10, 11] [Footnote 2] The article appeared more than five years after the councilors came together in the council’s predecessor organisation, the Climate Commission. The adverse impacts it referred to were conservative, and the council still couldn’t help itself; it concluded with comments not on the livestock sector, but on power generation. If we are facing a climate crisis requiring emergency action, why are critical measures seemingly off-limits for the Climate Council? At that point in the paper, the Climate Council went from items (i) – (iii) to items (i) and (ii) with no commentary between them. This appears to have been a typographical error. The presentation was not suggesting that anyone had been influenced by the links or that anyone was trying to influence others; it simply noted that the links exist.